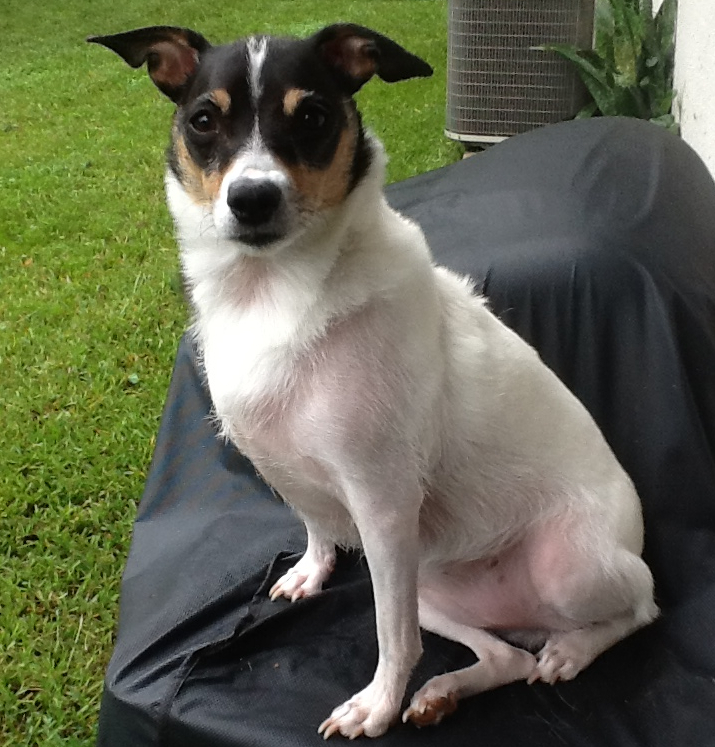 Zoe is a 4-year-old 17.5 lb (8.0 kg) female Rat Terrier who was diagnosed with Addison’s disease 7 months ago. She receives Percorten injections every 28 days, along with 5 mg of prednisone daily. She is active and playful but is always famished. Her water intake has also increased on the medication, but she isn't showing any incontinence. My major concern is that she has lost her hair on all four legs and belly, and now it is progressing up her shoulders, hind quarters, and to her head! Her lab tests are within normal range according to her vet, who wants to take a wait and see approach. I thought she may be getting too much prednisone, but my vet is afraid to cut back for fear of her ”crashing” and developing an adrenal crisis. Any thoughts on this? Zoe could sure use the help before all the other dogs start teasing her! Based on the clinical features of increased appetite, increased thirst, and hair loss, it is most likely that Zoe is being overdosed with the prednisone and has developed iatrogenic Cushing's syndrome (glucocorticoid excess). In support of that, the daily maintenance dose of prednisone or prednisolone in dogs with Addison's disease is only 0.1-0.2 mg per kg per day. So at 8 kg (Zoe's body weight), that calculates out to 0.8 mg to 1.6 mg per day. This is only 15-30% of the dose that she is now receiving every day. When you think about that, it's no wonder that she is showing signs of glucocorticoid (prednisone) excess! Remember that the adrenal glands in dogs with Addison's disease have failed so we must replace the missing hormones. These dogs will require lifelong replacement with both a mineralocorticoid (e.g., Percoten-V) and glucocorticoid (e.g., prednisone) hormone. Both the mineralocorticoids and glucocorticoid dosages must be individualized for that particular dog. The dosage of the mineralocorticoids can best be determined by monitoring the serum electrolyte concentrations (sodium, chloride, and potassium); the dosage is increased to decreased, as needed to normalize the circulating electrolyte concentrations. Prednisone (or prednisolone), a common glucocorticoid used to treat dogs with Addison's disease, is ideally started at physiological dosages (0.1-0.2 mg/kg/day). This dosage should be adjusted up or down as needed, as some dogs show exquisite sensitivity to the adverse prednisone’s effects. The amount of prednisone that enhances the dog’s well-being (normal activity level and appetite) but prevents side effects (increased thirst, panting, polyphagia, hair loss) may be very small. If a dog's serum electrolytes are normal on Percorten replacement therapy, dogs with Addison's disease aren't going to develop serious adrenal crisis, even if the prednisone dosage is lowered too much for a day or two. Your dog is receiving too much glucocorticoid supplementation. With time, even a mild overdose will lead to signs of iatrogenic Cushing's syndrome, which may include hair loss, increased thirst and urination, and increased appetite. I'd taper the dose down to 1 mg per day over the next couple of weeks. The prednisone is available as a 1-mg tablet, which would make dosing much more convenient. If the hair loss doesn't resolve after two to three months, I'd recommend that your veterinarian check a serum thyroid panel. Some dog's with Addison's disease will also develop concurrent hypothyroidism, which commonly leads to hair loss in dogs. Church DB. Canine hypoadrenocorticism. In: Mooney CT, Peterson ME, eds. BSAVA Manual of Canine and Feline Endocrinology. 3rd ed. Quedgeley, Gloucester: British Small Animal Veterinary Association, 2004; 172-180. Kintzer PP, Peterson ME. Treatment and long-term follow-up of 205 dogs with hypoadrenocorticism. J Vet Intern Med 1997;11:43-49. Klein SC, Peterson ME. Canine hypoadrenocorticism: part I. Can Vet J 2010;51:63-69. Klein SC, Peterson ME. Canine hypoadrenocorticism: part II. Can Vet J 2010;51:179-184. I can't imagine dropping the prednisolone like that- my addisonian dog is 13 pounds and gets at least .25 mg of prednisolone a day or he crashes- he also has to have his percortan shot every 21 days or he crashes. When he crashes, he won't eat, play, and he experiences what seems to agonizing pain in his abdomen and down his legs- he cries out if I try to pick him up or he lies down and kicks at the air, like he's trying to thrash some of the pain away. I have to balance the prednisolone and the dose changes with his condition, depending on how strong, hungry and thirsty he is or is not. Is it not better to risk some of the consequences of too much prednisolone in order to keep my boy, Echo, from crashing, withering, refusing food, and even death? Sounds like your dog may have another undelying condition that you are covering up with the increased doses of the pred. Dogs on Percorten and pred, even if not quite enough, will not "crash." Talk to your vet about a further workup and ask if the original diagnosis was 100% confirmed. I've been treating Echo for Addison's disease since 2010. Several months ago, he seemed weak and more tired than ever before; his breathing was also labored. I took him to the vet where he had blood tests done and was diagnosed with auto-immune hemolytic anemia. The treatment for this was 10 mg of prednisolone daily along with azathioprine (sp?) in order to shut his immune system down. His subsequent blood tests have shown an improved red blood cell count and since then, we've been slowly tapering the prednisolone and the azathioprine. He is now treated for the addison's at 2.5mg prednisolone daily- he weighs 13 lbs- and he is no longer being treated for the hemolytic anemia. We hope that his immune system has "reset". He's doing quite well... for now. He feels better, he runs outside, and he's very alert. He looks better than he has in a couple of years. I read that these diseases sometimes come in clusters. Do you have experience in treating these two diseases (Addison's and AIHA) together? Do you know, based on those two diagnoses, what I have to watch for in case of a third or even fourth dianosis? I know I have to watch for a relapse when it comes to the Addison's and AIHA. Echo has bounced back from the verge of death twice- he's a tough little dog- and now looks and I believe feels better than he has for at least the last couple of years. Thank you for your reply to my original question about prednisolone dosage for Addison's. You helped me look past the addison's at other possibilities; he was diagnosed and treated for AIHA and is doing beautifully now and hopefully will remain healthy for a long, long time. Hello Dr. Peterson, I hope all is so. I have a Great Dane with Addison's Disease. He receives a Percorten shot every 28 days. He was 128 pounds when diagnosed and put on 10mg of prednisone a day. He is now 158lbs. He is losing hair on his legs, belly and moving towwards his ears. He was screened 3 weeks ago for Thyroid. It came back looking normal. I am not sure his symptoms are from not having enough of prednisone. The articles you have posted with his exact systems show maybe too much prednisone . Any feedback you have would be greatly appreciated. Thanks so much. The daily maintenance dose for the average human patient with Addison's disease is 5 mg. so your dog is on about twice the dose needed. I'd cut it down to half and see if he maintains a normal appetite. Some dogs get addicted to the higher steroid dose and take a while to get the dose tapered downward. This all said I'm assuming that your vet has done routine blood work recently and found that all was okay. If that has not been done, do it now. It has taken a long time to induce the changes you see in your dog and it will likely take months to reverse them. Any significant hair regrowth will take at least 3-4 months. You are going to have to be patient. My dog Kauai was diagnosed in February and has been on 2.5 mg of prednisone daily since the diagnosis as well as 1ml Percorten every 28 days. About 2 months ago she started dramatically loosing her hair on belly & two months later she now is pretty much bald on her belly legs & moving up her back & face. This is very rare as she NEVER sheds let alone balds. Her temperament/appetite is completely normal so I'm really confused as to whats going on. I just switched Vets a couple months ago & she doesn't seem as experienced with additions. I took Kauai in last week and she suggested lowering her dose of prednisone from 2.5mg every day to 2.5mg every other day. Since changing her dosage Kauai has been doing fine but still very confused regarding this dramatic hair loss & what the culprit is. Any advice? Kauai 3 1/2 year old Boston Terrier 26lbs. Unlikely to be related to medication but lowering the pred dose should help if it is. I'd recommend ruling out hypothyroidism first. If thyroid function is normal, then I'd consult with a dermatologist. Hi Dr. Peterson, we give our dog (a golden-doodle with Addison's) 1.25 mg prednisone 2 times per week in the morning and 0.6 mg of fludrocortisone acetate daily over his evening food. In December we have dropped his prednisone dose down from 1.25 daily due to hair loss, excessive hunger and thirst and he seems to be doing great, electrolytes okay, still energetic and growing hair back. Would it be better for us to try to get a lower dose of prednisone to give daily rather than spreading the dose out 2/week? This article has been so informative! Thank you! Twice a week is a very low dose. I'd continue giving it if your dog is doing well. Dear Dr. Peterson, my 7 years old （12 1/2 pound ）Pekepoo mix was going through adrenal crisis this past Saturday and was rushed to the 24 hour animal hospital. We didn't know what was wrong with her in the beginning. She wasnt eating, throwing up, lethargic, bloody diarrhea and shaking. The doctors at the hospital did blood work and ACTH stimulation test and diagnosed her with Addison's disease. She got better in the hospital and was given DOCP injection .47ml and was released late Sunday. The doctors instructed us to give her 2.5mg Prednisone in the morning along with 1/4 Prilosec OTC 20mg tablet to prevent stomach ulcers. And also to get her DOCP injection in 28 days. My friend also have Addison's disease and he advised me that I should break up the prednisone into two dosages every 12 hours because it leave the system in about 12 hours and it's more natural that way. I been giving my dog only one dosage 2.5mg in the morning and do notice my dog being tired, a little shaking and lethargic about 18 hours into her dosage. Should I give her 2 dosage every 12 hours? Do you think 2.5mg is right for her now or too much? If too much, how much should I give her and should I taper off to give her a easy transition? Do you think it's necessary to give her Prilosec ? Thank you for any advice you can give! The prednisone given once a day is fine. I'd try to taper the dose down to 1/4 tab per day, especially if the thirst and urinations are increased. At long as she is eating, you can drop the dose quite rapidly. My dog who is around 50 lbs was diagnosed with Addison's about a month and a half ago and has been doing great in terms on energy and appetite but keeps peeing the bed at night. I have been tapering down her prednisone from 5mg daily to 1.25mg of prednisone every 3 days over the past month and a half. She is still peeing the bed at night and peeing a large volume of urine. Do I need to keep cutting back on the prednisone? When I brought her back for her percortin V shot after 25 day they tested her blood and all her values were normal. If the thirst is normal, then the urinating in the bed is due to something else. Talk to your vet. what test should the vet run to see if the dog is on the right amount of Prednisone? My dog has Addisons going on 4 years now and it feels like we are still in a trial & error phase. Our dog is the only dog at our vet with this disease. They couldn't diagnose her initially, I had to take her to an emergency med vet clinic because she was crashing. After 4 days there, she came home - diagnosed with Addisons. We live in a very small town with limited access to vets. The next vet is about an hour away. The reason I ask about the Prednisone is because the vet is having me continually increase her dosage because her Cortisol level is so low it is not even registering on his blood test. A month ago I took her in because she was not eating or drinking. He did a blood test and tells me she doesn't need her shot of Percorten yet (it had been 6 weeks since her last shot) instead told me to give her 10mg Pred pill in AM & another 10 mg pill in the PM for 7 days then drop it to 1/2 pill in AM & a 1/2 pill in the PM (total of 10 mg daily). This seemed to be a temporary fix as her appetite increased for a couple of weeks but now she is crashing. as of yesterday, No eating, minimal drinking (only can get her to drink if I flavor her water with beef broth, some vomiting and diarrhea. Her appointment with the vet is this afternoon. It's now been 10.5 weeks since her Percorten shot (1cc shot & she weighs 65#) so I am definitely going to get that but my concerns are about the Prednisone. Prior to this month she was on 5mg a day & she was always thirsty & hungry. I wondered then if that was too much. It's very frustrating that after 4 years we are still trying to find a "maintenance" plan. After much reading on here it looks like 5mg should be more than adequate. Is dosing for Pred more of an observation physically or is the vet correct to be using the Cortisol level from the blood work? Thanks for your insight!! I hope your puppy is feeling better. I have a 14 pound dog with addison's and we manage the disease as much as we can. Echo usually does best 2 or 2.5 mg prednisone every day, for over five years. It's a lot of trial and error, and just when you think you have it right, something changes. It's a crazy disease. However, I have never heard of anyone waiting 10 weeks for a percorten shot. Echo has to have his at least every 25 days. I even started to order his percortan online and give him the shots myself now. I pay approximately $180 for eight injections. At the vet it was almost $300. I also don't have to stress him out with a trip to the vet. Sometimes I think the best advisors are the ones who also have a dog with addison's. I hope this gets posted. Feel free to write. I understand the frustration... the great pretender... I hate that he has Addison's, but I'm happy that we can manage it most of the time. My 5.8 kg Russell Terrier Josie was diagnosed with Addison's several months ago after going into at first diagnosed Addisonian crisis. We almost lost her, as it took time for the vet to rule out more common causes of the symptoms. The 0.1 mg of Florinef and 2.5 mg of Prednisone (half of a 5 mg tablet) brought her out of crisis, but the polydipsia and resulting polyuria have basically caused ruination of our carpets and wood floors. Looking up recommended dose of Prednisone, I calculated that she should only need between .6 and 1.2 mg per day, so with my vet's okay, I reduced her daily dose to about 1/8 pill per day (about .625 mg). While she still drank and peed a lot during the day, she could go overnight without peeing the bed and was quite comfortable if I took her water out of her pen overnight. About a month later, she became very ill again and I asked for more blood work to be done. Her potassium/sodium ratio was out of whack again and the conclusion was that she had lost further adrenal function, so her Florinef dose was increased to .15 mg and the ratio came back into range. Unfortunately, the thirst/peeing increased again and she began wetting the bed at night and leaking a lot when resting. It is almost impossible to split a 5 mg pill small enough, but I tried to reduce the amount to a small sliver of Prednosone daily. There is no significant change to her thirst/frequent urination and leaking. Is it possible that the Florinef has enough glucocorticoid activity to render the Prednisone unnecessary? Or is it possible that her adrenals are still making some glucocorticoid, but not the aldosterone? Josie goes for twice daily runs on our farm, chasing rabbits happily, but in the evening, can appear very distressed and uncomfortable, biting at her tail and licking herself obsessively, most likely to clean up the wetness from her leaking. Can you offer any insight? Florinef contains some glucocorticoid activity so I would start by stopping the pred altogether to see if that helps. If the urination continues, I would switch from Florinef to Percorten injections. A complete urinalysis and culture are also recommended to rule out UTI. Florinef never worked for my dog, Echo. He has to have a shot of percorten at least every 25 days or he begins to lose strength. We also switched from prednisone to prednisolone. I was hoping it would help his kidneys and liver not have to work so hard. I hope it's ok that I comment here- obviously Dr Peterson knows best, and it's very cool that he can give guidance, direction and suggestions to help educate owners of pets with Addison's. Thank you for that Dr Peterson. Addison's is such a weird disease. I also sometimes give him home-made pedialyte. It's far less expensive than at the store and easy to make. I don't know if it really helps, but I don't think it hurts him. I'm open to and interested in communicating with anyone who has information or experience with canine Addison's disease. Echo was diagnosed in 2011- we're managing it, but I still have questions. Sorry about the typo - should have said "at first undiagnosed" in the first line. We already did the complete urinalysis and culture to rule out UTI, but with such dilute urine, even in morning samples, it may be worth repeating when we can get more concentration. I'll stop the Prednisone altogether and watch carefully for signs of energy loss and/or muscle weakness. Many thanks for the invaluable service you are providing! Hi, I was doing research online about addisons, thryoid and prednisone for Danes and came across this forum. Similar to others, my dane has been diagnosed with Addisons and is on prednisone. She has been on prednisone since March 2016, taking 1/4th of a 50mg pill. She is 6.5 yrs old, and approx 130-135 pounds. The vet did an electrolyte test in August 2016 and levels looked good. Hair loss has happened over the past two month, so we did a thyroid test and it came back low-normal. Would the prednisone mask the thyroid. Test results? If so, would taking her off the medication for 4-6 weeks be enough to re-rest? Or should we try lowering her dose to see if over-medication is the culprit? She is panting a bit on walks and when excited for food. Water consumed seems average, and she's always been a 'want to eat all the time' dog, so hard to tell on that front. If anything, the pred would falsely lower the thyroid levels, not make them higher. I'd lower the pred dose to 5 mg per day (the human dose). The dose you are now giving could account for hair loss.